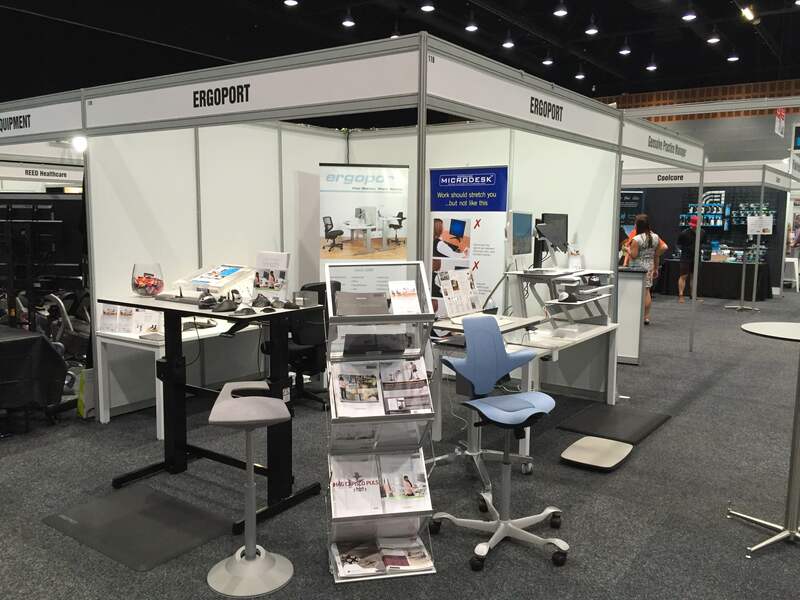 Take Advantage Of The Ergoport 10% Off Sale For Australian Physiotherapy Association Conference 2015 Delegates. To show our appreciation to the Australian Physiotherapy Association and all its delegates Ergoport is offering a 10% Discount on all products bought on the Ergoport website until November 6th 2015, but hurry only 2 weeks remain on this great offer. According to The British Journal of Sports Medicine. Among other horrors, sitting too much can cause heart disease, strained neck, foggy brain, tight hips, poor circulation, mushy abs, inflexible spine, diabetes, and colon cancer. Oh, and it can make you fat. Warnings about the dangers of a sedentary lifestyle have long been touted by medical experts and the media, but still, many people spend at least eight hours a day in their office chair. In fact, a January 2015 report published in Annals of Internal Medicine found more than half the average person’s waking hours are spent sitting. Perhaps the reason so many workers fail to heed the warnings has something to do with the discrepancies surrounding the correct amount of time one should stand versus sit. Should I stand every 20 minutes? Exercise every 30 minutes? Wait, even standing kills you? Never mind, I’ll just sit. According to The British Journal of Sports Medicine , there is a magic amount of time to move about (and stave off all those dreadful aforementioned health problems). Their new guidelines, which come from a slew of studies that were reviewed by a panel of international experts, say a combined two to four hours of standing and light activity spread throughout the workday is ideal. For employees with jobs that are predominantly desk based, workers should aim to progress towards accumulating two hours a day of standing and light activity like walking during working hours, eventually progressing toward a total accumulation of four hours per day, the journal reports. 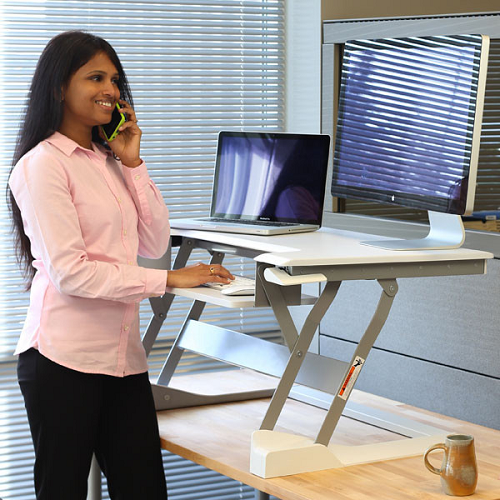 So, try breaking up the workday with standing-based work, the use of sit-stand desks, or short active standing breaks. “The key is breaking up your activity throughout the day, Alan Hedge, a professor of ergonomics at Cornell University explained to The Wall Street Journal , which covered the journal’s findings. “Sitting all day and standing all day are both bad for you,” he said. Hedge had slightly more specific recommendations, saying that for every half hour at work, employees should strive to sit for 20 minutes, stand for eight minutes, and then move around and stretch for two minutes. That seems a bit hard to remember, so maybe try to keep this in mind in order to encourage yourself to move around: standing burns one-half to one calorie more a minute than sitting, which adds up to as many as 240 additional calories in four hours. Now that’s motivation. APA 2015 Conference popular products. Presenting an ultra easy standing desk solution, which quickly converts a tabletop into a healthy sit-stand workstation. 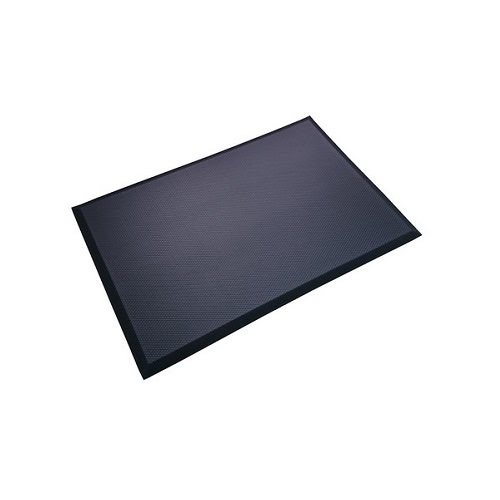 Simply place the WorkFit-T on an open surface and you’re ready to work! WorkFit-T saves space because it moves straight up and down, always staying within the footprint of your desktop. 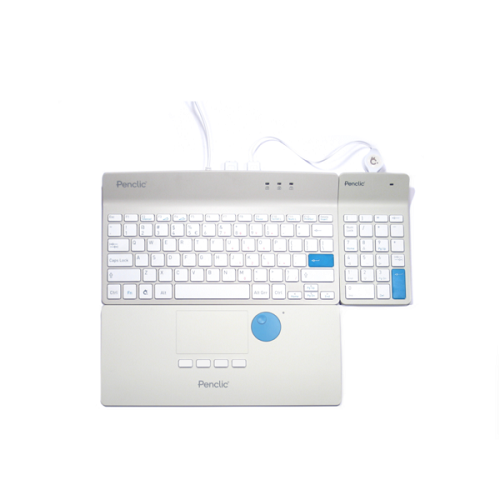 The Penclic Trio Bundle combines the Penclic Wired Keyboard, Penclic Wired Keypad and the Penclic NiceTouch. Penclic Mini Keyboard's comfortable low Quiet-touch keys minimise noise while you are working. The normal size keys provide a good tactile feeling which results in a quick response when typing, creating a relaxed and efficient time in front of the computer. Reducing pressure of back muscles on the spine and strain - Stimulating circulation on the feet and legs- Encouraging changes in posture frequently for preventing stiffness at joints and muscles - Easing the stiffness on neck and shoulders - Halving the muscle energy to support the back and legs. The Muvman is the first variable seat in the world. 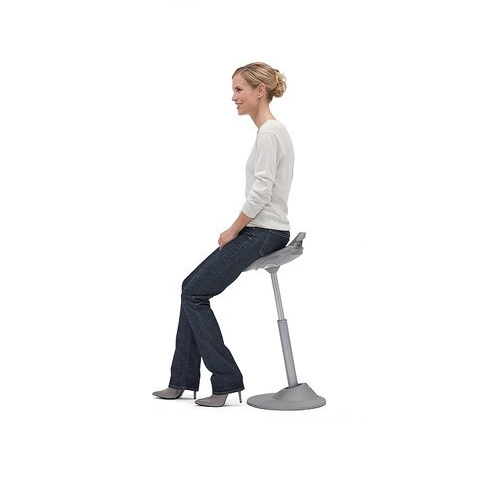 This means you’re able to adopt optimum posture at different heights, in any seated position. This makes it perfect for those working at higher desks such as receptionists or architects. Enjoy sitting satisfaction whatever the inclination.